“Come on Jack, aren’t you hungry?” His face starts to soften and smile at the ladies and the bikers who are taken by him and his big inquisitive eyes. Once we’re in a kind looking woman greets us. She has a bird necklace on, light brown hair and a soft spoken voice. Is she Lauren? She shows us where we will be sitting and brings two high chairs. “It’s that way” the women points to the back. I start my long journey with my two fifteen month olds. They are excited now. It’s impossible to get them to go the same direction. “Cool! Thanks, that’s awesome!” I say. It’s a dingy little couch with a dingy old tiger stuffed animal, a cute brown bear, a plastic truck, a box of crayons, coloring books. I wonder whose kids it was set up for, Lauren’s? It keeps Jack and Fiona engaged long enough to change their diapers. “Can you watch them while I pee?” I ask. “Of course.” The two ladies say, one the kind woman who greeted us, the other our waitress, equally as kind. She tells me she has a thirteen year old daughter. bikers. They smile at her. Jack can’t stop looking up at the wonderful birds, neither can I. My timing was impeccable. The babies slept the first two hours of our trip, perfect timing for our lunch break! And great pick of place, “always go with your gut instinct” I tell myself and pat myself on the back for following my own advice! 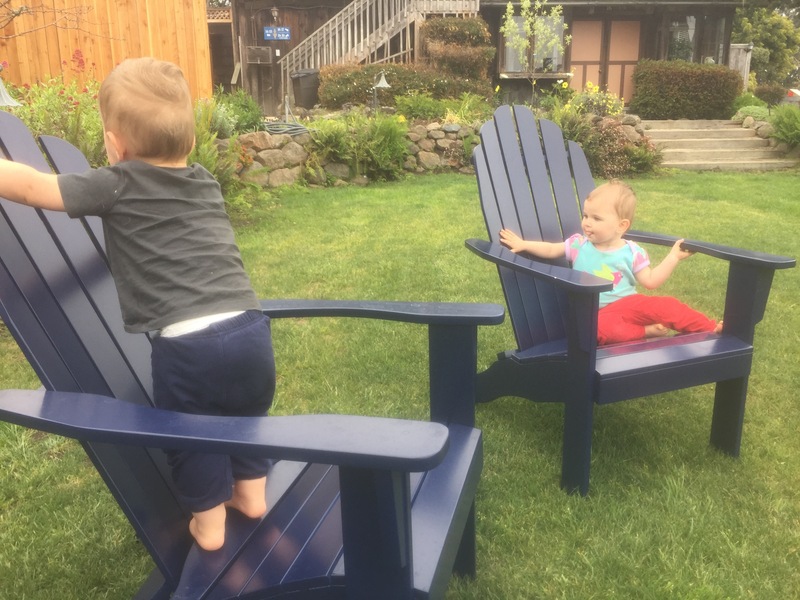 It’s been challenging not using a stroller, but interesting as well, especially for Jack And Fiona who are getting to experience so much more being free! E-I-E-I-O and peas on the floor!